Robert Brindley's Blog: Christmas Is Coming!! Only 7 shopping weeks to Christmas!! Stuck for a present? Visit my Shop for a variety of gifts, including DVDs, Books, Limited Edition Prints, Greetings Cards & Gift vouchers. 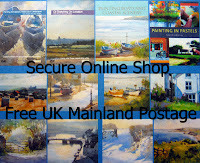 All with free postage to UK mainland postcodes. It's never too soon to start your Christmas Shopping!! Tired After A Hard Day's Play! !